This is an interview with Marc Titus, Founder & Director of the Sedona Yoga Festival in Arizona. I first met Marc when he approached the Give Back Yoga Foundation with an offer to host a training for hundreds of professional yoga teachers, to help them share yoga with our nation’s veterans. With the suicide rate among veterans at an all-time high, Marc and his wife, Festival Producer Heather Shereé Titus, believe that sharing yoga with these men and women is a gift for everyone. Rob: What originally motivated you to start a yoga festival? Marc: I moved to Sedona in 2007 to become a yoga teacher, after 7 years of practice. Even after that, though, I had to go down a personally torturous road, involving finding a way to transcend and heal from a very materialistically-lived life; it was during this transformation that I became a certified yoga instructor. Finally, while I was living in Los Angeles in the winter of 2011/12, on an especially hard day, with literally the last dollar to my name in my pocket, the spirit of Sedona appeared to me, and said, “It’s time to return to Sedona…it’s time to bring consciousness to humanity; and thus Sedona Yoga Festival was born.” I didn’t know how I would get back, how I would pay for it, or how it would unfold, but I said YES! Within two weeks, I was sleeping in Sedona in a beautiful house under a full moon, with money in my pocket, all my ‘stuff’ with me, and a new and profound sense of purpose. 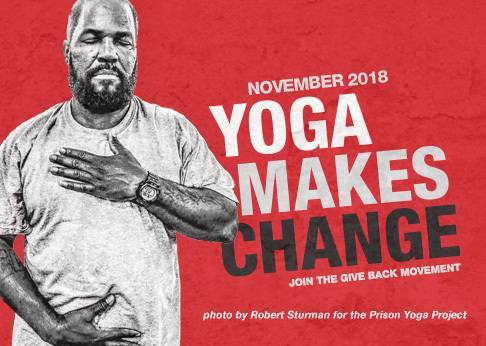 What motivated you to partner with a non-profit organization for this year’s yoga festival, and to focus on introducing therapeutic yoga for veterans? I’d been reflecting on my relationship with my father, who was a Vietnam War veteran affected by PTSD. It was like a lightning bolt that came to me: we can use the energy of the yoga festival to bring awareness to an ever-growing problem in our country. We can help returning veterans with mental health recovery and rehabilitation tools that are inexpensive, and can help relieve the symptoms of stress-related physical and non-physical injuries. This approach would also promote community collaboration. As you know, Rob, the situation is very real, with several thousands of veterans returning with PTSD, depression, anxiety, etc. I feel one solution our community can offer is simple: yoga, right now, brings about and supports inner peace. I’m interested to know, what do you see as outcomes? My friend Chris Courtney, an Iraq War combat veteran and yoga teacher, once said to me, “heal our veterans, heal our communities.” We are all affected by the return of so many veterans with trauma, and part of the solution is where and how we direct our attention. Therefore, at the 2014 Sedona Yoga Festival we envision over 200 teachers receiving the Mindful Therapeutic Yoga Practices for Veterans training. We hope to support them with Yoga For Veterans Toolkits, in collaboration with the Give Back Yoga Foundation. And we hope these teachers will return to their communities prepared to serve our veterans and their spouses. If every teacher we train aims to serve 50 veterans in his or her local community, together we would provide 10,000+ veterans with useful tools. These will help them overcome the debilitating and often severe symptoms PTSD, Traumatic Brain Injury, and the other myriad experiences that are making life incredibly difficult for returning veterans, their families, and their communities. Those are possibly real outcomes. We simply cannot solve the problem in the same way it was created. We need to step out of the energy of old, into a model of Giving Back–Dharma, Service in Action. How do you maintain a mindful corporation, and emphasize “compassionate action” in dealing with festival partners? I think it’s hard to run a “conscious business” with all that is going on in the world today. The accoutrements of our modern world, while purporting to be “helpful,” have actually created a situation in which we are always doing something, always needing to do more, always striving. There is a lot of pressure to keep moving, to grow, etc. As an antidote, I try to be present to what’s happening right now, to life itself flowing through me, to you, to all of us right now. The more I embodied this, the easier things got, and the more mindful, awake, and aware I’ve become. As a result of a consistent and dedicated asana practice that completely stilled my overactive “monkey mind,” I’ve come to see that it all unfolds without my effort, and that if I am “to be” compassionate in collaborations with business partners, then I must learn to be compassionate with myself first. What advice would you give other festival owners? Maintain your connection to, and listen only to your inner voice, to your visions and dreams. Through your practice cultivate an intimacy with yourself that allows you to trust this voice, and follow it wherever it takes you: walk your own path. Be an advocate for Dharma, Service in Action. What are some of your ideas about, or hopes for, the future of yoga in America in the next decade? I see yoga “doing” what it has always done, assisting humanity in letting go of all the trappings that prevent the inevitable; consciousness expanding infinitely. I believe yoga will continue to evolve, back to its own roots, right here in the west, as the masses of Western yogis realize what traditional yoga is all about. I believe we will see an expansion of “giving back” in the very near future, as we realize that we are all the same. In that individuated sameness, will come over 7 billion solutions to the one “problem” of separation. When that happens, the world will be a totally different place. Dharma. Service in Action. SYF Gives Back: Mindful Therapeutic Yoga Practices for Veterans. This 2-day pre-conference training at the Sedona Yoga Festival provides yoga teachers with certification in techniques and practices that are clinically proven to offer relief to veterans returning home affected by post-traumatic stress, traumatic brain injury, and other trauma and emotional stress. Join us February 6-10, 2014 in beautiful Sedona, Arizona.